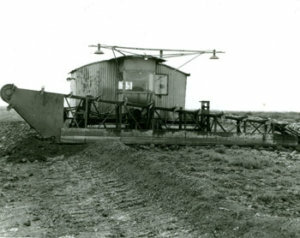 The purpose of this machine is to prepare the surface of the high bog and cutaway for the efficient operation of all other machines, by levelling it. The machine consists of a large tractor unit carrying a leveller boom in front. As the machine advances on its long tracks, the boom cuts away the high areas, losing the spoil in the hollows. The tractor unit has a rigid main frame supported on caterpillar type power driven tracks and is powered by diesel engine and gear transmission of standard manufacture. The drive to each track is taken from, either side of the standard transmission differential unit which incorporates a reliable brake/gear steering arrangement. The drive between the standard gear transmission unit and the track sprocket is by chains and sprockets. A selection of travel speeds are obtained by a combination of change speeds in the gearbox, and change sprockets. The drive to the cutting boom is taken from the P.T.O. shaft on the standard transmission unit. The boom has a light frame-work made up of standard steel sections, around which is driven two conveyor type chains running on sprockets at each end and in guides along the bottom and top. Across these two chains, arms are fitted, projecting beyond the front of the boom. The projecting portion of the arm has a cutting knife and scraper palm. The boom is controlled for height and level by hydraulic rams. Bord na Móna used a Drainage Machine to accelerate drainage in poorer areas - Learn how it worked.